Simple CD/DVD Menu is an autorun menu for data CDs and DVDs, mostly useful for software storage and installation. As it's name suggests, it is very simple to use, but it even includes a full tutorial for people who prefer to have a walkthrough. In addition to running any file type from your menu (executables, documents, videos, etc. ), you can also add web and e-mail links. 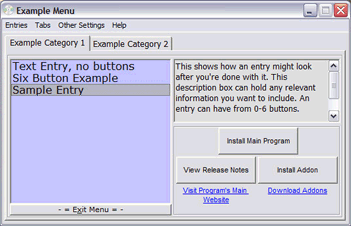 All editing is done in a WYSIWYG (what-you-see-is-what-you-get) environment, meaning that as you edit your menu you will see exactly how it will look when it is run from CD/DVD. You can actually use it as a file menu system for any storage device, such as portable hard drives and USB flash memory drives. Download it from the Download page in the menu above and give it a try, it is fully functional without having to register! The only limitation is a registration reminder screen that will pop up whenever you run a menu.